After a few weeks in the condo, it’s beginning to feel more like home. Tomorrow, the movers bring some of our belongings, such as our bedroom set (no more living out of boxes!! ), clothing and who knows what else, as it’s been so long I’ve forgotten what we own. This has been good preparation though for determining what we need vs what we want, as most of the stuff will either go into a smaller storage unit, or will be sold. This entry was posted in Uncategorized on November 15, 2013 by viberkley. It’s hard to even remember the old master bath, which was very small. This has plenty of room, with a walk-in shower and a built-in linen closet (to be finished in Phase II). The tile in the kitchen went in a few weeks ago. I really love the colors and shape. It makes me think of very blue water. Tonight I came home to see that the tile for the fireplace has been installed. It had to wait until the black steel surround was installed, which happened a few weeks ago. The TV will be mounted above the fireplace. Can’t wait to have a fire in the fireplace, especially now that the weather is getting cold. The fireplace tile is done! Jim and I have moved most of our belongings from the apartment we have been renting in the Barrington to the condo. The work is not finished and the walls will be painted this week. Thanks to our friends Greg and Diana, we’ll stay at their place this week while they are away on vacation. The kitchen is now fully functional and is looking nice! Jim takes a look at the work that has been completed. This week, the tile is grouted. 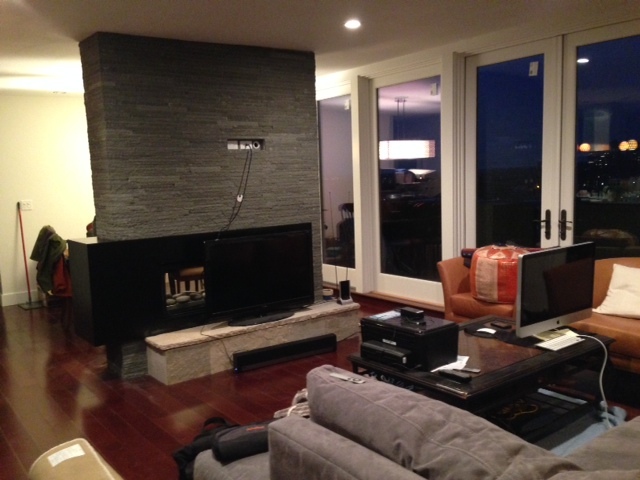 We are still waiting on a steal surround for the fireplace. Once that’s in, the tile goes up for the fireplace. 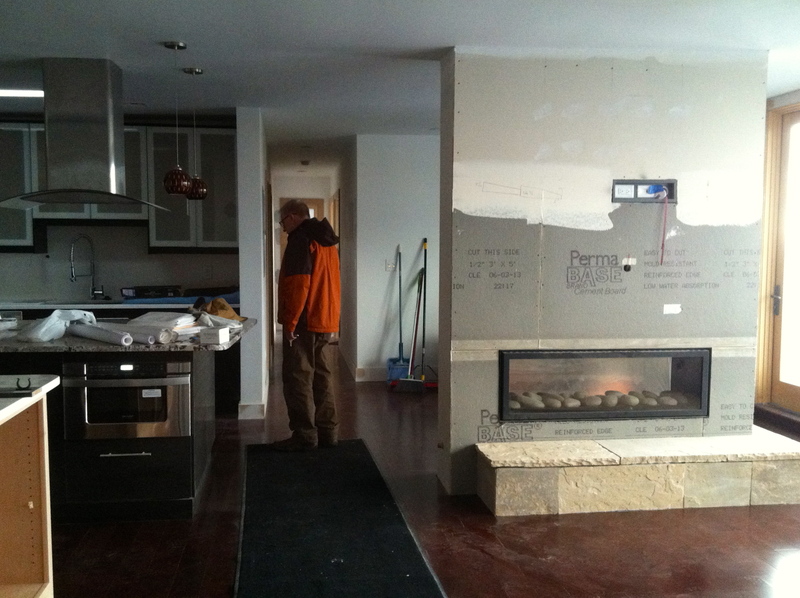 The two-way fireplace will separate the dining area from the living room.